Below is an excellent Foreign Policy article by Jacob Kushner explaining how Haiti's unclear land tenure policies undermine investment and cause displacement on Ile a Vache. While the article focuses on one small island, these issues are playing out throughout the entire country. Improving the climate for investment and human rights requires high-level committment for addressing one of the most politically sensitive issues in Haiti. The full article follows. The grove is among the casualties of a $260 million development project planned by Haiti’s central government. It is designed to turn Île-à-Vache into the Caribbean’s next tourism hot spot. With an annual per capita GDP of less than $900, Haiti is one of the poorest countries in the world. Five years after a devastating earthquake that killed more than 200,000 people and caused some $8 billion in damage, Haiti’s leaders are banking on tourism to help buoy recovery and drag the nation out of poverty. The Île-à-Vache project is ground zero for these hopes. Wooing investors with tax breaks and the promise of internationally funded infrastructure upgrades, the government has developed a plan that includes a new airport, a series of hotels, and an 18-hole golf course. But just two years after it began, the project has stalled. As of March, not one of the 2,500 hotel rooms anticipated by Haiti’s government has appeared. The stoppage is not for lack of commitment from Port-au-Prince: Haiti’s annual investment in travel and tourism is estimated to have jumped from 4.3 percent of the national budget in 2013 to 6 percent last year, according to the World Travel and Tourism Council. Rather, the Île-à-Vache project has been stymied by conflict between the government and local residents over ownership of the island’s land. Haiti has a complex, bureaucratic land registry, as well as weak rule of law. It is very difficult for Haitians to prove a viable land title or get due process if their land is seized. On Île-à-Vache, Mesura and his wife are among the many residents who saw their property — land that they thought they owned — expropriated by the state in the initial phase of the development project. Frustrated that they weren’t being consulted about the seizures or about the tourism plans in general, residents sought to disrupt the project through a series of protests in December 2013. Since the conflicts over land erupted, private developers seem hesitant to break ground on the island, according to the mayor and one interested businessman. 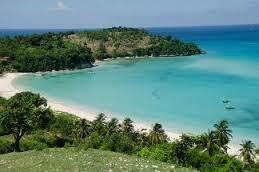 As with Caracol, Haiti’s government is claiming land on Île-à-Vache in the name of economic development. The tourism project began in earnest in January 2013, when the government put out a call for private enterprises to develop the island. In addition to offering a 15-year tax holiday, the government sought to incentivize investment through a series of infrastructure upgrades, including a new $13 million airport, renovations to the public market, and improved access to drinking water. In May of that year, the government published a decree proclaiming the island’s land to be a public utility. Soon after the announcement, seizures began. In December 2013, a community group of local residents called the Organization of Île-à-Vache Farmers (KOPI) began organizing public protests demanding that the government rescind the decree that Île-à-Vache land is a public utility and that it directly include community members in further planning for the project. A few months later, in March 2014, Tourism Minister Stéphanie Villedrouin stated that 100 families would be relocated and that they would all be compensated. KOPI alleges that throughout 2014, the construction of the airport alone caused hundreds of people to lose their farmland — and thus their livelihoods. As of December, dozens of those affected said they had not received compensation. (The legal office that corresponds with the press on behalf of the Ministry of Tourism did not respond to a request for comment.) As recently as February 2015, residents demonstrated against the Dominican construction company contracted to build the airport. In December 2014, Mesura’s land still sat unused. He used to sell his coconuts at 400 gourdes (about $8.50) per dozen. “It’s with that money that we built this house, that we buy food,” his wife says. Like most of Île-à-Vache’s residents, Mesura understands the desire to transform the island to improve the local economy. But he says residents shouldn’t be collateral damage of the government’s plan. “I’m not saying it’s bad to have tourists come to our island,” he said, standing on the front porch of his home and frowning. “But we must not be displaced by them.” Reporting for this piece was made possible by a grant from the Pulitzer Center on Crisis Reporting.